MVDA Spares Market magazine from the 1960s. Homepage. This page: Second issue of the MVDA's own magazine, designed to promote their members' vehicle parts businesses. A review of Spares Market magazine. This relatively obscure motoring magazine dates to the mid/late 1960s. Priced at 1/6, and sponsored by the MVDA (Motor Vehicle Dismantler's Association), it offered a guide to MVDA-registered scrapyards, or vehicle dismantling centres as they'd probably be called today. 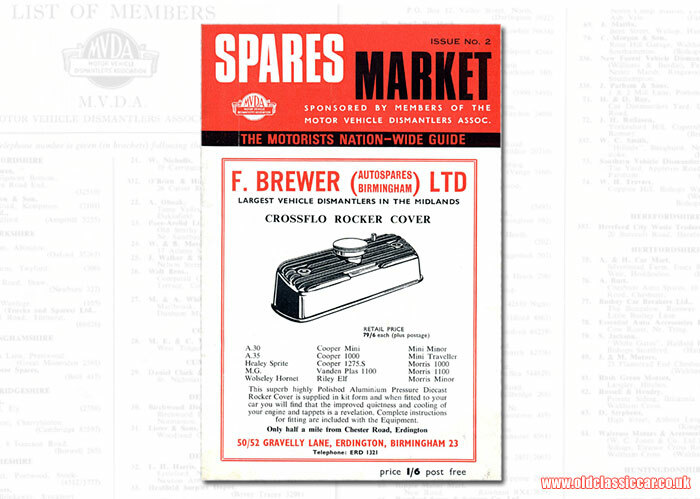 The cover features an advertisement for F. Brewer (Autospares Birmingham) Limited, which apparently was the "largest vehicle dismantlers in the Midlands". Despite breaking old wrecks for parts, they also did a range of brand new car parts, as evidenced by the illustration of a Crossflo rocker cover. These polished rocker covers were available to suit a range of British cars, specifically products of the sprawling BMC combine. There are many many advertisements for car breaker's yards within the forty pages of Spares Market magazine. One that stands out for me, and one that I've heard tales of before, is Motolympia, situated close to the station in Welshpool. People older than I have waxed lyrical to me before about this once-amazing emporium, packed to the rafters with all manner of car parts to suit both pre- and post-war cars. This was back in the days when scrapyards were groaning with mainly British cars, some unrecognisably mangled or deteriorated thanks to years spent sat in the scrapyard, no wheels on, waist-deep in muddy puddles, the water reflecting the many colours of leaked oil. So long as you were careful, and the yard owner was an agreeable type, no-one really bothered if you spent the day mooching around searching for that illusive part, or just looking around for anything that caught your eye. There are a few scrapyards around that still operate this laid-back approach to life, but they're getting few and far between, and those that do allow daytrippers tend to be stocked with ten-year-old modern cars, rather than the older interesting stuff. Other scrapyards advertised in Spares Market. Anyone who spent the 1960s living in the Hounslow area of Middlesex, and ran an older car, probably came across Power Brothers Ltd, at Heston Airport (originally known as Heston Air Park) at some point. This month they were selling, amongst other things, a '65 Austin 1800 that had been rolled (£400), a '63 Renault 8 that had also been on its roof, and a couple of Zephyrs. The full-page advertisement for Bird's of Aston (South view Garage, Aston, nr Sheffield) makes for much more interesting reading though. They had 17 acres of vehicles to pore over, from tiddlers (such as Austin A30s, A40s, Bonds, and Minis) to more refined carriages such as a Mk6 Bentley, Humbers, and Jaguars in Mk1 and Mk2 guise. An article elsewhere in the magazine describes the Bird's operation in more detail. They were in fact founder members of the MVDA, and had approaching 2,800 vehicles on site at any one time, employing fifteen men. Maybe visitors to the site will remember some of the following companies, all of whom feature in Spares Market: Harold Poyser Ltd (Manchester), Cornforth Auto Spares Ltd (Co. Durham), Express Salvage (Smethwick), J.J. Barwick of Sidcup Motors, Walcross (Motors and Accessories) Ltd, and Motor Crash Repairs (Finchley) Ltd, to name just a selection? Editor's comments regarding abandoned cars. The problem of scrap cars simply being dumped on Britain's streets was growing. Until recent times the owner of a worn-out car might have expected a modest payment from the scrapyard operator for their vehicle. Times were a-changing though and few businesses were now able to offer anything for scrap cars and, worse, in most cases it would now require the car's owner to pay for their car to be scrapped. As a result, a large number of old clunkers were simply being abandoned at the roadside, or dumped in fields. As well as being an eyesore to many, a dumped car would often prove to be irresistable to inquisitive local children, sometimes with disastrous results (I well remember playing in a dumped Fiat, and a thrupenny bit Austin FG lorry when I was a nipper). The MVDA proposed that road fund licensing, which was often ignored by motorists in the pre-ANPR days, be binned and replaced by an increase in fuel tax. They then advocated a first-registration fee of £8 whenever a new car was put on the road. This fee could be collected by whoever finally owned the car before it was consigned to the scrap pile, so long as he/she disposed of it at a recognised facility, and not in the nearest hedge. This, it was hoped, would provide a financial incentive to dispose of a wreck responsibly. An article, borrowed from the Motoring Correspondent of the News of The World newspaper, repeats this proposal, pointing out that by 1970 they expected 1,000,000+ vehicles per year to reach the end of their working lives, and would need disposing of properly. A hotel owner in Kent, fed up with a 1948 Austin 10 that had been abandoned outside his premises took matters into his own hands and had it towed away, and placed outside the Ministry of Transport for them to resolve the problem. Apparently 600,000 cars had been scrapped in the last year, a quarter of which had been dumped rather than taken to a scrapyard, so there was definitely a problem looming, especially as car ownership was still very much on the increase. Cars in the small ads. The small ads classifieds at the back of the magazine are also well worth a perusal. Amongst the usual suspects, one or two interesting vehicles are mentioned, either as complete vehicles or parts for them. A yard in Salford had parts in stock for a 1949 Invicta Black Prince, not a car that turns up too often nowadays (saying that a Black Prince did appear at local shows in recent times). A 1966 Humber Super Snipe with just 1,300 miles on the clock resided at L. B. Spares and Coachworks Ltd in Kent, unfortunately it had burnt out but still had good mechanical parts to offer. They could also supply a Mk1 Cortina owner with a brand new set of car seats, of which they had ten sets in stock. W. and H. Evans in Manchester had Mercedes Benz 170 parts on the shelf, in addition to Armstrong Siddeley 234 and 236 parts. Autowrex (Bradford) Ltd had a 1955 Lagonda in. F. Brewer (Auto Spares) Ltd of Erdington, Birmingham, must have been well worth a visit. Their stocklist included the following rarities: 4x Rolls-Royces, 1927-1931 40/50hp, plus a 1956 Lloyd, 1927 Austin 12, 1929 Trojan car, 1928 Morris Oxford, and a 1927 Ford 14/9 - all in "dilapidated condition". 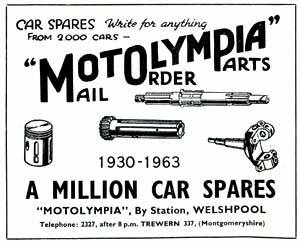 The Spare Parts Wanted section is also an interesting read, an owner of a 1937 Cord was looking for a replacement engine and transmission for his car, while someone in Didsbury, South Manchester, was on the look-out for early Rolls-Royces, including Ghost models. A number of news items, courtesy of the TRTA (Traders Road Transport Association), get coverage on pages 28 and 29 of the magazine. The 70mph "experimental" (hah) motorway speed limit was about to be extended for a further two months' trial, due to end on Sunday 12th June. This experimental limit continues to this day. A fifteen month trial, where heavy goods vehicles were banned from the outside lane of 3-lane motorways, was also due to start at the time of publication, and again is something still enforced to this day. The remainder of this interesting old magazine is given over to member advertisements. Is the magazine still in print? The MVDA, originally established in 1943, is still very much in business.